We say: Your coach will probably be young and physically fit, and the string they used is likely their own regular string and is suited for their style of play, their age, and how much use it gets. Usually its a hard, polyester string that is economical, and lasts a long time, which suits their requirements, but probably not yours ! Solution: We suggest stringing in a better quality, multi-filament, softer string that produces less vibration and is therefore kinder on shoulders and arms. Essential as customers fear the dreaded tennis elbow issues. The benefit of this string’s added elasticity is that allows you to increase ball speed, and hit more powerful shots. Solution: Instantly achieve more power, control, feel and touch. We also have a LOYALTY CARD SCHEME to keep you up to date, remind you of what string combinations you have tried, and lower the costs overall. We say: Don’t confuse restringing at high tension, with creating more power. It doesn’t, and is a common misunderstanding. Solution: We advise the customer that if they want increased power we will need to restring in fact at a lower tension. Stringing at a higher tension reduces power, but it does increase control. A good way to visualise this is to compare and contrast the effects of first, jumping up and down on a trampoline (low tension, generates high power, but reduced control), with jumping on a hard floor (hard tension, low power – you aren t going to get very high – but much easier to land on exactly the same spot every time !). VISIT OUR STORE IN FARNHAM FOR ALL YOUR TENNIS, BADMINTON, AND SQUASH RACKET RESTRINGING. Located in Surrey, on the Hampshire border; with free car park on site. We have two electronic machines and a wide range of string and plenty of useful knowledge to help guide you through. Equally we are happy to order in any one off, specific string, which usually takes 24 hours – just ring 01252 717214 to ask. Open 7 days a week year round, we offer stringing while u wait and its not necessary to ring and warn us unless its a typically busy late Saturday afternoon ! 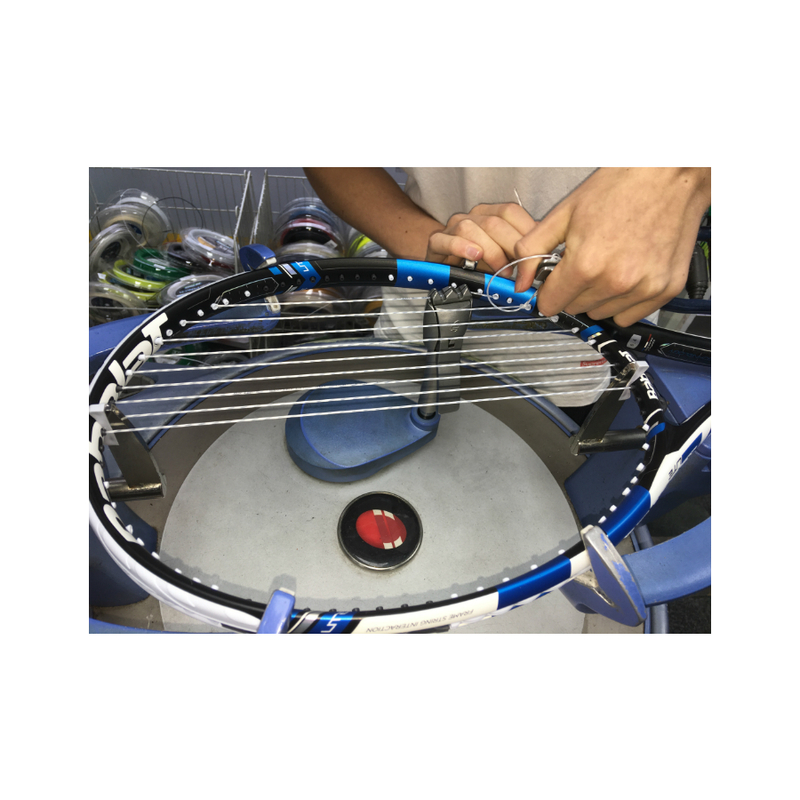 CLICK HERE to see more stringing information and pricing. This entry was posted in Badminton, Squash, Tennis. Bookmark the permalink.